I liek my nations Hymn. Montenegro hymn is best hymn,about warriors,proud and noble people,CLANSMAN(Yeah,about them),and music is little bit in Therion style. Every country has metal bands. It is only songs which separate them. Good Russian,Norwegian,Swedish,Montenegrian,Croatian,Spanish band is good everywhere. Yup, Gibboni is the best Croatian musician imo! Better Cajka,than Serbian Turbo Folk! And from Zagreb Sejo Kalac!!! So did anyone listened to any band from my country? No,OFF,only he degrees of decadence are different-serbian stupid "singers" are un moral,un everything,and croatians are almost. Well, I am not some fan of that music but it is nice at some occasions. Ok,Like Trio Gušt,but others are to kill! Don't know if you understand me. I hope you're kidding. You're free to spam in here as much as you want, but we're all a bit allergic to nationalist ideas. So I hope I just got you wrong. I add: not to nacionalistic ideas (I have some too ), but the nacionalistic and non-respectful to the other ideas. By "nationalist" I mean prejudice, judging people by their nationality and treating all members of one nation alike ("XY are..."). I can't imagine you or anyone else in here having that kind of ideas. About music in my country, I like my national anthem, I´m not such a great fan with folkloric music, but I think they do a great job, and is very popular here such as reggaeton, pop or happy punk. We will continue to discuss in our old topic, you know which one ! ok? I see you have misunderstanded me! No,I was thinking of sebian turbo folk singers. And I have said wrong. Now,I know I have decreased your image of me,and I am once again sorry. I don-t have nothing against Serbia.There are some real great bands,like Alogia,May Result,Kraljevski Apartman...etc. except Aluqak, who very likely will eat you! Oh c'mon Luth! you dissapoint me! But I am too young be eaten!! 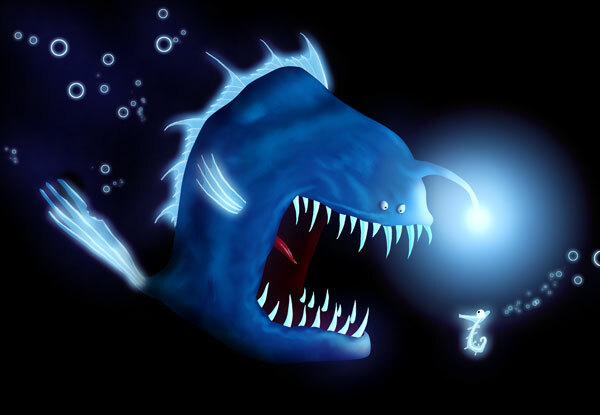 !Please,spare my skeletonic body,you will get diarea of me( ),and you will become one deseased anglerfish. Even food poisoning-don't risk that,there are many meals to be eaten!